Sainz. Roethlisberger. Two of the NFL's biggest off-field stories will converge in the very near future, as the TV Azteca personality who caused a stir in the Jets locker room will interview some of the Steelers and their returning QB. Sainz will be returning to her job this week, and has said she will stay out of locker rooms this time around. "I'm not going into the locker rooms anymore," Sainz said. "It's not a good place right now for me. I don't want to be in there." Sainz famously interviewed Mark Sanchez of the Jets on September 11 when a flurry of errant footballs were suddenly thrown in her direction and cat-calls and whistles rained down upon her from Jets players. She took to Twitter to explain the situation, posting a photo of what she wore that day. A media firestorm followed in the days after, debating exactly how appropriate her attire was and questioning whether or not women (or men, for that matter) even belong in locker rooms anymore. It was the biggest potential sexual harassment issue facing the Jets since the new one they're facing this week. Sainz had this to say about her clothing in a letter to Roger Goodell: "I like to look good, but that in no way makes me any less dedicated to the sports journalism world. I'm proud of being a woman and I'm not shy about hiding it. However, this in no way makes me any less of a professional." 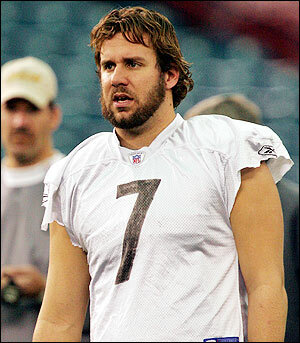 The choice of the Steelers and Roethlisberger is certainly an interesting one for Sainz and TV Azteca. But with the possible exception of Brett Favre, there has been no bigger story off the field in the NFL this year than Roethlisberger. Combining these two celebrities should provide two things: keeping Sainz in the news and giving huge ratings for TV Azteca. Reminds me of the "Today in Springfield" bit on the Simpsons. WOW! Does she make sure that the camera always shoots her good side?! ?